Sogen Chiba, a calligrapher born in Ishinomaki, in the Miyagi Prefecture, began studying calligraphy during his childhood. Because he lost his teacher when he was still young, he acquired and developed his own original techniques. The aspect of his work that has attracted the most attention in Japan and overseas is his use of tobashi, or sharp splashes of sumi intentionally made through rotational movements of the handles of brushes called chochoho, which have long and thin bristles resembling whips. 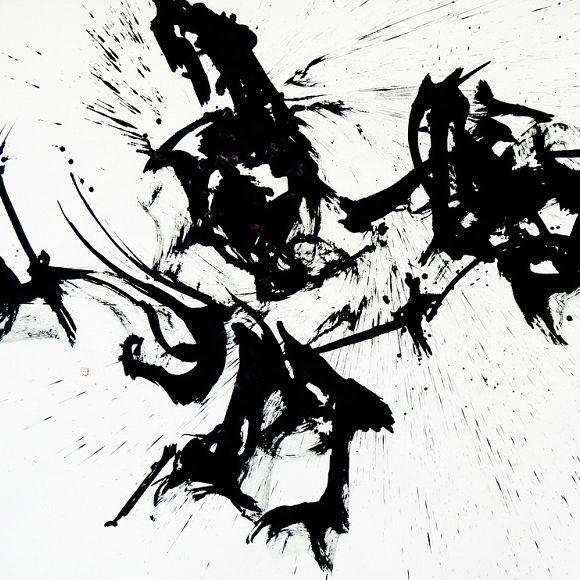 In 2007, a collector in New York invited art enthusiasts and others to his own penthouse for a private exhibition of Chiba’s works, where the artist demonstrated his calligraphic techniques. The tsunami caused by the Great East Japan Earthquake on March 11, 2011 swept away more than 100 of Chiba’s works stored in Kesennuma City including a representative work of over 10 meters in length. However, he soon recovered his energy and held large-scale private exhibitions in Tokyo and Sendai under the theme of “the repose of souls and rebirth”.